Rural Affairs Minister Mairi Gougeon with Andrrew Skea on a visit to Skea Organics at East Mains Farm, Dundee. The Scottish Government has called on Defra to put measures in place to prevent UK producers from importing European-grown seed potatoes in the event of a no-deal Brexit. Speaking on a farm on the outskirts of Dundee, Rural Affairs Minister Mairi Gougeon pointed out that Defra’s current arrangements meant Scotland would become a third country and therefore unable to export seed potatoes to the EU, yet the ware potato and processing industry could continue to import European seed potatoes for a year following exit day . Ms Gudgeon said that by allowing this one-way trading relationship, Scotland’s world-renowned seed potato industry risked losing its 13.5% EU market share and there would be little incentive to fill the internal UK market demand through the sourcing of Scottish seed potatoes. For plant health reasons the EU only imports seed potatoes from member states, although Switzerland and Canada have derogations which involve such stringent testing very little is imported. Meanwhile Scottish growers have protected their high-health status by a notification system for imports and the industry voluntarily sourcing seed from the domestic supply chain. 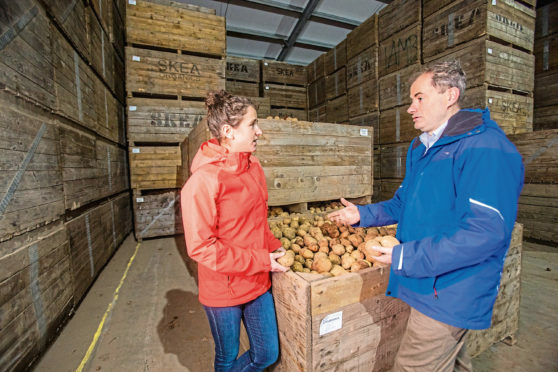 Organic seed potato producer and exporter Andrew Skea, who farms East Mains near Dundee, told Ms Gougeon he didn’t know if the varieties he currently grows for the German market were worth planting in the spring. “If we’re not going to have access to Germany next season, there’s no point in planting them,” he said. “This is a relatively buoyant potato year but if you have a variety no one in the UK has heard of, they won’t want to buy it and it will just be fed to the cows.